D-Marin, one of the major marina chains in the Eastern Mediterranean, was among the lead sponsors of IWMC 2018, the ICOMIA World Marinas Conference. 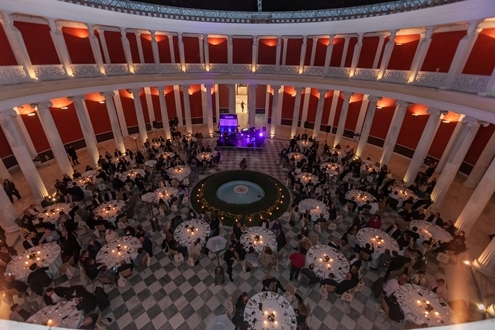 D-Marin also hosted the exclusive opening reception on the first night of the conference, which more than 400 delegates from academia, business and politics attended, on October 25-27 in Athens. The ICOMIA World Marinas Conference (IWMC 2018) aimed to address all the critical issues that the marina industry faces with a global perspective, as well as explore topics that shed light on the current situation and future of the industry. Professor Theodosis Tassios, of the National Technical University of Athens, who bridges the gap between ancient Greek and modern technologies, will give a keynote speech during the opening of the Conference, which is expected to draw attendees to exchange ideas under the theme “Cross Sea Challenge for Marinas – Setting the Scene for Collective Development and Growth”. In addition to a discussion about technologies for making efficient use of energy and natural resources in an environmentally sound manner, specifically, electricity storage by molten metal batteries, there was also a special report from John Kalogerakis, CEO, JMK Anthropocentric Corporate Training and People Development, on ‘Training Marinas the Anthropocentric Way’. During the Conference where D-Marin had a booth, delegates also heard detailed reviews on the marina markets of the world, with an emphasis on America, Asia, Australia, the Mediterranean, MENA and Russian markets. Experts from Greece’s marina industry showcased current major waterfront and marina projects and explained the Greek concession model in marinas. There were also speakers presenting their expertise on electric boat propulsion, solar piers, floating houses and floating infrastructures. Furthermore, information on security issues at ports and marinas, oil pollution crisis management and marina marketing were shared. Other popular topics included the international growth of superyacht charter as well as managing change in boating and ownership. In addition, ICOMIA presented its latest policy papers, introduced its Environment Guide, and explored global issues affecting marinas, such as new international guidelines for marina design and ISO regulations for ports. On the last day of the Conference, conceived for an international audience including marina owners, operators, developers, consultants, equipment manufacturers and service providers, who wish to follow the latest developments in the industry and aspire to become a part of this change, a special program of historic exploration within ancient Athens was offered. D-Marin is a Dogus Group company that was established to set a new benchmark in operations of the marinas. By managing 11 unique marinas in Ionian, Aegean & Adriatic Seas, D-Marin creates one of the largest international chain of marinas in the Eastern Mediterranean that promotes recreational yachting and develops sustainable businesses that encourage local employment and growth within the economy. Total berthing capacity is 8,471.